No one is hurt after a structure that held the State Street Saloon succumbs to the blaze early Monday. PORTSMOUTH, N.H. — A building housing a restaurant collapsed following a large fire in downtown Portsmouth, New Hampshire, firefighters said Monday. The fire spread from the three-story building early Monday to a neighboring building that houses several apartments. Firefighters rescued one person and others had evacuated. Fire Chief Steve Achilles said all 17 people who live in the buildings are accounted for, and no one was injured, the Portsmouth Herald reported. Numerous fire departments responded to the scene. The building was reduced to a pile of rubble. 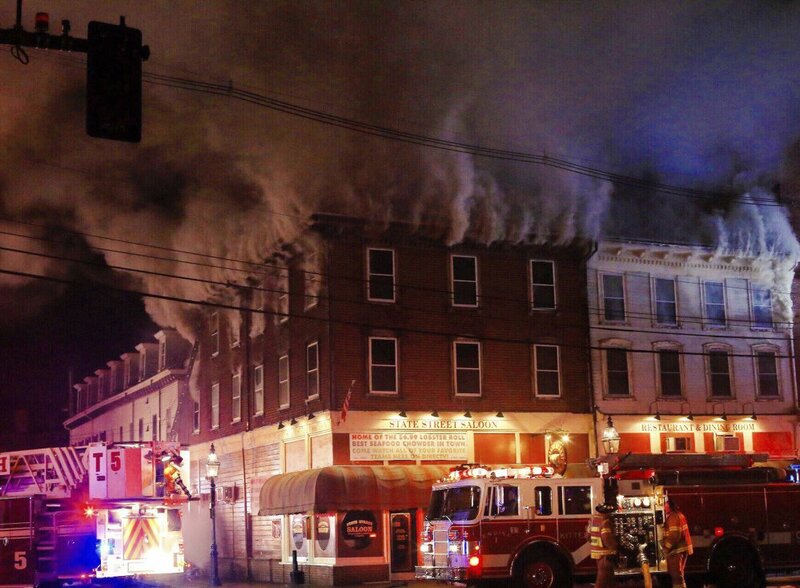 The blaze broke out about 12:30 a.m. in a building that houses the 34-year-old State Street Saloon near the city’s Market Square, the heart of its downtown area with shops, restaurants and many historic buildings. Investigators believe it started in the kitchen, but they had not determined a cause. The Red Cross met with residents to make sure they have a safe place to sleep and access to food. A nearby restaurant, Brgr Bar, responded to the news by offering employees and tenants of the burned buildings free meals for the month of April. On its Facebook page, the restaurant said it will partner with Favorite Foods, a restaurant wholesaler. “Please bring a recent pay stub or utility bill and know that this community will rally behind all of you during this difficult time,” the company said.